You can add one or more secondary data connections to your form template that can either query data from a document library or list, or submit data to a document library on a server running Microsoft Windows SharePoint Services. A secondary data connection is any data connection to an external data source that you add to a form template. This data connection is different from the main data connection that is created when you design a form template based on a database, Web service, or settings in a connection library. You add a secondary data connection only if you cannot query or send data through the main data connection. When you add a secondary data connection to your form template that queries data, Microsoft Office InfoPath creates a secondary data source with data fields and groups that corresponds to the way that the data is stored in the document library or list. Because the data structure in the secondary data source must match the way that data is stored in the document library or list, you cannot modify existing fields or groups in the secondary data source. A data connection that queries data from a SharePoint document library or list automatically returns all of the items in that document library or list. If you are using a query data connection to populate a list box, drop-down list box, or combo box control, and the control contains too many items or you want to display only items that meet a specified criteria, you can use a filter in the control to limit the number of items. Find links to more information about filtering the data displayed in a control in the See Also section. You can also configure each query data connection to save its results so that users have access to the data when their form is not connected to a network. Depending on the nature of the data, you may want to display the query results only when users are connected to a network. Security Note: If you are using a secondary data connection to retrieve sensitive data from an external data source, you may want to disable this feature to help protect the data from unauthorized use in case the computer is lost or stolen. If you disable this feature, the data will be available only if the user is connected to the network. Add a rule You can configure a rule to use the query data connection whenever the condition in the rule occurs. Add a button You can add a button to the form template that users can click to get data by using the query data connection. Use custom code If you cannot add a rule or button, you can use custom code to get data by using the query data connection. Using custom code requires a developer to create the custom code. When you add a submit data connection to your form template, you can configure the form template to allow users to submit their form data, and you can configure the submit options for forms that are based on your form template. Add a secondary data connection. Configure the form template to use the secondary data connection. On the next page of the wizard, type the URL of the SharePoint site with the document library or list, and then click Next. For example, to use a document list on a SharePoint site with the URL http://www.adventureworks.com/EmployeeList, you type http://www.adventureworks.com/EmployeeList. On the next page of the wizard, select the check boxes next to the values that you want to receive. If the form template will be published to the document library, and you want forms that are based on this form template to get metadata about the form, select the Include data for the active form only check box. If you want to store the results of the query with the form template, select the Store a copy of the data in the form template check box. Selecting this check box stores the query results in the form template. Because the data is stored in the form template, the data is available in the forms that users fill out, even if their computers are not connected to a network. On the next page of the wizard, in the Enter a name for this data connection box, type a descriptive name for this secondary data connection. This is the name that appears in the Data source list in the Data source task pane. If you want this query to run automatically whenever the form is opened by a user, select the Automatically retrieve data when form is opened check box. 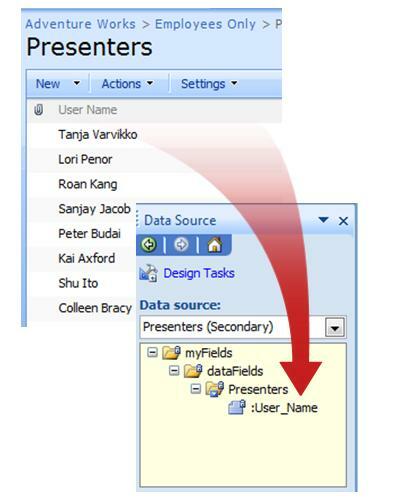 If you want forms that are based on your form template to use this data connection after the user opens the form, you can add a rule to the form template that uses this data connection under a certain condition, or you can add a button to the form template that users can click to use this data connection. You can add a rule to the form template to get data from the query data connection whenever the condition for the rule is met. The following procedure assumes that you have created a query data connection for your form template, and that you have configured a control on your form template to display the data from that data connection. Double-click the control that you want to display the query results. You can add a button control to your form template that your users can click to use this query data connection. The following procedure assumes that you have created a query data connection for your form template. Double-click the button control that you just added to your form template. In the Refresh dialog box, click One secondary data source. In the Choose the secondary data source list, click the secondary data source that is associated with the query data connection, and then click OK to close each open dialog box. Add a secondary data connection that submits data to your form template. Configure the form template to allow your users to submit their form data to the document library. In the Data Connection Wizard, click Create a new connection to, click Submit data, and then click Next. Under How do you want to submit your data, click To a document library on a SharePoint site, and then click Next. 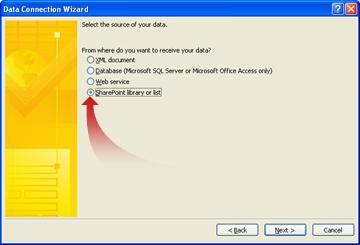 In the Data Connection Wizard, in the Document library box, type the URL of the SharePoint document library. Tip: You can also use a formula to ensure that each form name is unique. Tip: If the function requires parameters, select the function in the Insert Function dialog box, click OK and then, in the Formula box in the Insert Formula dialog box, double-click the function that you added, and click a field or group. Find links to more information about functions in the See Also section. Note: If your formula uses the division (/) operator, make sure that there is a space before and after the division operator. If the division operator does not have a space before and after it, InfoPath may interpret "/" as a separator for XPath location steps rather than as a division operator. To overwrite any existing forms in the document library with the same name, select the Allow overwrite if file exists check box. After you add the secondary submit data connection, you need to configure your form template to allow users to submit their form data by using this submit data connection. Change the text that appears on the Submit button. Change the keyboard shortcut for the Submit button. In the Submit Options dialog box, select the Allow users to submit this form check box, click Send form data to a single destination and then, in the list, click SharePoint document library. In the Choose a data connection for submit list, click the name of the submit data connection to the SharePoint library.